It's Oscar season again and, as usual, the best stuff Hollywood gives us is left off the award list. Sure, things like Les Miserables and Lincoln are really great films, but what about the real movies that deserve to be there too? For years, the Academy has ignored genre films of all stripes to much perpetual anger. A token Oscar for the Lord of the Rings here, a small technical Oscar for Harry Potter there. Some truly breakout performances have been honored, such as Heath Ledger's enduringly amazing portrayal of the Joker from The Dark Knight, but where is Robert Downey Jr's Oscar for his incredible performance as Tony Stark? Where is Joss Whedon's Oscar for directing? Why has no one hurled an Oscar at Tom Hiddleston yet? The Stella Award, by our very own Ash! It's time to take matters into our own hands. Here at Stellar Four, we want to recognize the REAL movies and actors that took our breath away in 2012. That is why we've created our own award to celebrate the best genre movies that Hollywood has to offer. Ladies, gentlemen, I give you... THE STELLA AWARDS! That's right, Hollywood may have Oscar, but we have Stella! Even better, the esteemed members of the Academy are... you! That's right, you get to vote on who should win the prestigious Stella award for outstanding films and performances this year! An award for the geeks, by the geeks! Go under the cut as I introduce our nominees with my fabulous and handsome co-host! *walks on stage in a beautiful evening gown* Hello and welcome to the first annual Stella Awards! Stellar Four is proud to present this award show so that we can honor the best genre films of 2012! I'm your host, Meghan B., and I'm delighted to be here to reveal the nominees. I can't do this job alone, though. Every superhero needs a side kick, and I need a co-host. Ladies and gentleman, put your hands together for NATHAN FILLION! Nathan, it is so good to see you! Do you mind if I call you Captain Tightpants? Ha ha, oh Nathan, you're such a card! Nathan and I are proud to present the nominees for this years Stella Award. You will find your voting instructions at the bottom of the post. Without further ado, the nominees! There you have it, folks! Our nominees for the 2012 Stella Awards! 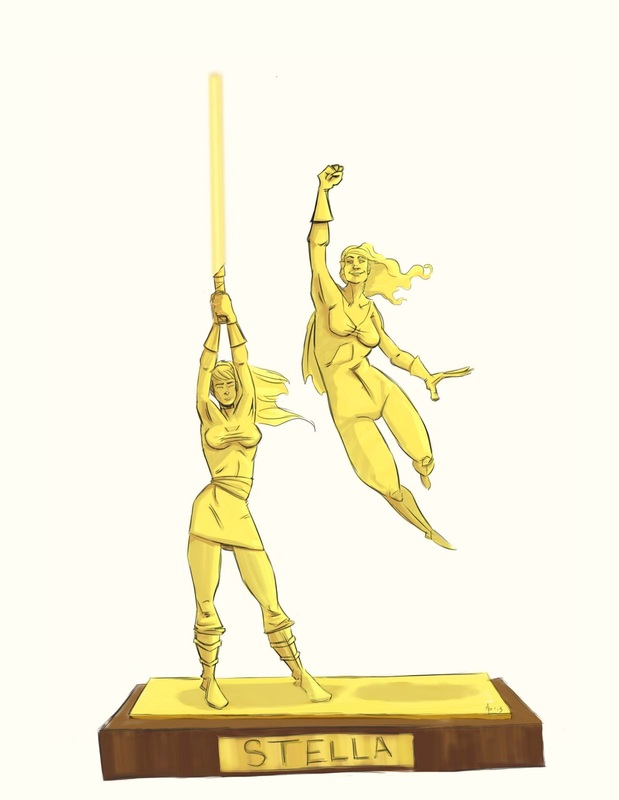 Now is your chance to weigh in and let us know who deserves our special golden girl statue! Will The Avengers sweep the awards? Will Looper pull out an upset? Only time will tell! Click here to cast your vote for the 2012 Stella Awards! Let your voice be heard! On behalf of Nathan and myself, we thank you for your vote. Tune in Monday, Feb. 25, for the Stella Award post, where we will reveal the winners! Good luck to all the nominees, and may the odds be ever in your favor!